All of New Zealand plant things on Labour Weekend and garden stores are pretty busy. 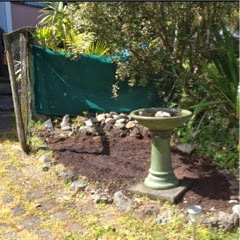 Kane got started on Friday and filled in the raised beds ready for his chillies and capsicums and planted a few of them out. I got my tomatoes in the ground and also planted some pumpkin and watermelon seeds on that side. The leeks and rhubarb are looking good and with them I planted some carrot, onion, turnip and radish seed. Over on the section I had earmarked for my herb garden, I got some compost and vege mix put down and then planted some lettuce, mesclun and rocket as well as some chives, basil and oregano. 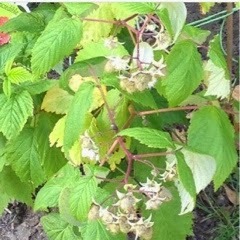 Along from the herb section is where I planted raspberry and gooseberry bushes. The gooseberry doesn't seem to be doing much but the raspberry bush is doing well and is producing fruit - just have to wait for them to go red. 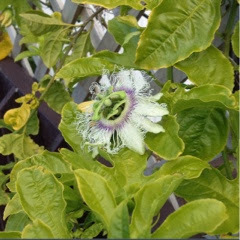 Meanwhile on the balcony, the passion vine has started to produce flowers and they are quite amazing looking! The strawberry plants are thriving and we are looking at a nice small crop this year - again just waiting for them to turn red. One of my favourite things about working in the garden is the friendly wildlife. 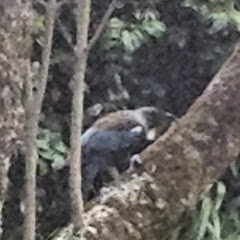 This is a Tui who came to inspect our work - they have a lovely song. 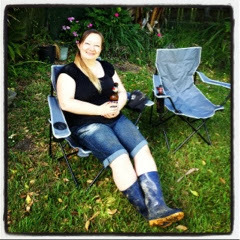 Another of my favourite things is that all good hard garden work should be celebrated with a beer - even if it is only 11.30am! I have been an erratic (at best) yoga attemptee for many years. I love the idea of yoga and I imagine myself in the future being the kind of person that wakes up early to do their daily yoga practice. I'm a big ball of tight muscles and bad posture and I believe that yoga will really help me. It's just that when it comes to the crunch - 6am: warm bed for a few more minutes or exercise - I forget all about the health benefits and my goals. Lately, I've been thinking a lot about yoga. Specifically, what to learn and how to learn. There's a lot of variation when it comes to yoga and in the past I've tried gym classes, Dru yoga, Bikram yoga, Youtube videos, yoga DVDs, a yoga book and an iPad app. I found this fun little quiz on Yoga Journal to help me decide on what yoga practice to investigate and I've been looking around online at local classes, private teachers and how to practice at home. Most classes seem to be about $20 for a casual visit but offer discounts if you purchase a 10 class pass. Private yoga tuition is about $70 per hour. One of the places I came across that appealed was The Loft. They are $19 per casual class (10 class passes are available at $170) and include a dinner. 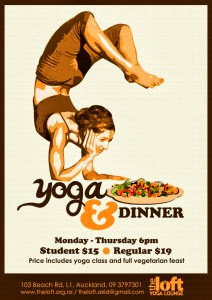 And by coincidence, my friend had sent me a text inviting to me this yoga class only a few days after I had seen it. It seemed like an obvious opportunity to give it a try. I entered into a long room that was tastefully decorated with plenty of dining tables and a food counter at one end. There were shoe racks at the door and once I had popped my shoes on there I noticed how nice the carpet felt. I paid the lady my money and she pointed out where the toilets, changing room, water cooler and studio was. Once my friend had arrived and we caught up a little, we headed into the studio and picked up a mat from the mat box. I had forgotten my mat so I was glad that they had some there and that I didn't have to pay extra to rent one. I noticed that most people used the studios mats. The room was pretty basic, with a light wooden floor, off-white brick walls and a large window with lots and lots of greenery outside. There was a communal changing area off the back of the studio where you could leave your bags and next to this was a bookcase with blankets. This was an Ashtanga class so we started with centering ourselves, doing some breathing and a long OOOHMMMM before we moved onto sun salutations and then the fundamentals and a lot of the primary series before doing some of the shoulder stands in the closing sequence and then the closing postures. I personally found it hard work and I definitely worked up a sweat. I found I was unable to get into some of the postures and sometimes my muscles shook and I had to take a break but it didn't put me off because I was just doing what I could and I know that all that good stuff comes with more practice. Once we were in corpse pose we covered ourselves up with a blanket and just relaxed for a little while and then it was time for some tasty food. I had a delicious meal of salad, rice, cauliflower tempura in cranberry sauce and roast vegetables followed by an apricot muffin - yumm. The next day I was a bit sore so I knew that muscles had been worked! With the dinner included I though it was probably one of the best value for money venues in the city and obviously a 10 visit card would be even better value. I would certainly like to go back, probably on a monthly basis if I can work out transport. I love pancakes and I look forward to Sunday morning pancakes all week! This is a relatively new tradition for us and I can't believe we didn't think of weekly pancakes before now, and its also relatively inexpensive at under $2 per batch of pancakes (if you leave out the blueberries and switch maple syrup for jam). I leave out the soya flour and sometimes the vanilla essence if the soy milk I'm using is a bit sweeter. Blueberries are for special occasions and if I have maple syrup then I use it otherwise I spread a little jam on the hot pancake. 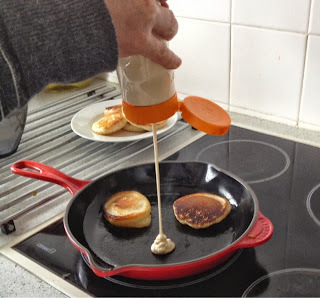 Last Sunday we decided to try out a new thing - putting the batter into a clean squeezy bottle. This worked out really well as there was more control of the batter so the pancakes were a better size and shape. It would be possible to keep the pancake mix in the bottle in the fridge for quick pancakes on the go, but as usual we made the whole batch!